An “it depends” answer can be frustrating for someone who is looking for a magic number to help them decide if they are on the right track. There is already a tremendous amount of uncertainty surrounding the entire retirement planning process to begin with. In general, people are living longer, health care costs are rising, pensions are disappearing, and a cloud of doubt surrounds what Social Security will look like decades from now. But personal retirement plans are meant to be personal. Determining how long you plan to live or if you are you going to project a short life expectancy due to serious health issues can drastically change your future retirement needs. Entering your retirement years with or without a mortgage or consumer debt will also influence your retirement income needs. The main idea is that lifestyle choices go a long way in determining how to create the most accurate estimate of our future income needs and wants. Given all the unique variables and uncertainty regarding how much someone needs to save to achieve a high probability of success, it makes sense to have some general guidelines around that help us track our progress. One rule of thumb for retirement is based on savings factors that are linked to your income. With this approach, savings goals are created based on multiples of income to help people track their progress throughout the accumulation stage of a working career. Fidelity has identified retirement saving benchmarks for various ages along the journey towards retirement. Keep in mind that the savings factors used by Fidelity are adjustable based on when you would like to retire and your anticipated lifestyle needs during retirement. For instance, a 45-year-old planning to retire by age 67 with an average lifestyle would have a target savings of 4 times salary set aside for retirement. However, adjusting the retirement age to 65 in a similar scenario bumps the savings factor up to 6x salary. You can look at your retirement savings factors based on your current age, when you want to retire, and desired lifestyle expense needs. Conventional wisdom says that you’ll need to replace around 70 to 90 percent of your current income in retirement to maintain your same lifestyle during retirement. Another commonly used rule of thumb in retirement planning settings is often referred to as “The 4% Rule.” This refers to a general assumption that you can take a 4% withdrawal from your retirement savings balance annually and increase the amount with inflation each year. Therefore, if you have $1 million in your retirement accounts, you would be able to spend $40,000 in the first year. This basically means that for every $1,000 per month you want to spend in retirement, you will need approximately $300,000 worth of retirement savings. It is important to recognize these savings benchmarks are simply milestones and they operate as somewhat of a moving target. A few years ago, the so-called magic number guideline was 8x salary by age 67. 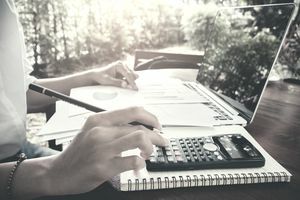 The best way to determine if you are saving enough for retirement is to run a more detailed retirement calculator and to create a budget plan for retirement based on realistic lifestyle expense needs. This will allow you to review your entire financial picture and includes personalized Social Security estimates, the potential use of equity in your home, desired income ranges based on your goals, and other income sources such as inheritances, part-time work, or rental income. A successful retirement plan requires more than a one-size-fits-all approach. General guidelines such as Fidelity’s savings factors provide an acceptable starting point to determining if you are on the right track with your retirement savings. For many people, the savings factors will serve as a healthy wake-up call. For others, this approach makes too many assumptions for you and lacks a customized approach. A better approach is to run some retirement calculators based on more personalized goals to see if you’re tracking toward a secure retirement or not.